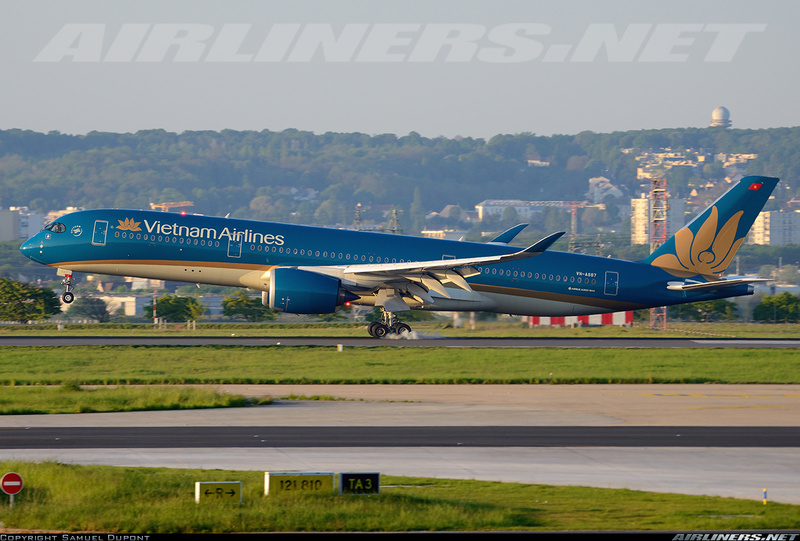 Welcome to my trip report on Vietnam Airlines Airbus A350-900! My initial plan was to fly on the airline's Boeing 777 both ways from Ho Chi Minh to Hanoi and return and its the cheapest way to fly the aircraft types of your choice. However, I would require to do a stay over at Hanoi in order to accomplished this mission so after considering the factors, I decide to just do a one day trip there and back, flying there on the Airbus A350 and returning on the Boeing 777. Since I have already flown 1/2 of the airline's A350 fleet (at this time), I knew my chance of flying on the previously flown aircraft (VN-A886 and A889) are pretty high, but I was still going for it. Later on, I did a check on the aircraft type, this sector to Hanoi was still scheduled to be operated by the A350, but the return sector was changed to Boeing 787 Dreamliner aircraft, it was swapped with the flight before mine. I could make the flight change but had to pay a fee which I thought just stick to it and I would do this domestic flight on my next visit. If the aircraft was changed to the A321, I would definitely pay to change the flight. Flying on my favourite 787 aircraft, I can't complain much. 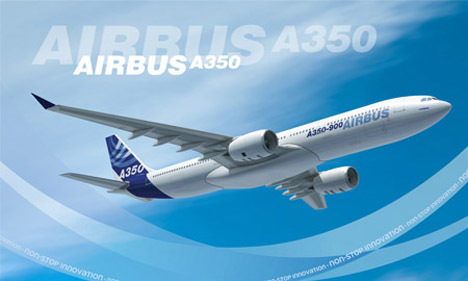 Airbus A350 was originally launched in 2004, based on the A330's fuselage, the only difference between this and the A330 was some new aerodynamics features and engines but a couple of years later, the aircraft manufacturer made changes to the original design due to the complaints from the major airlines. 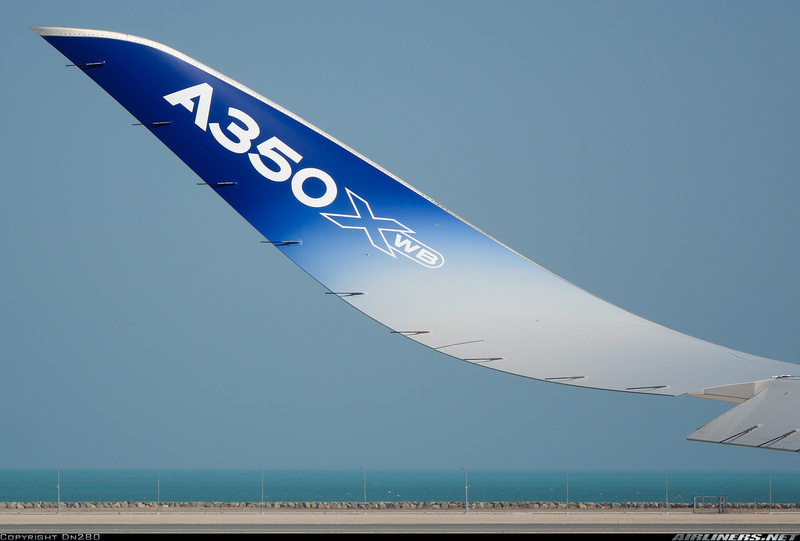 This A350 is the first in the family to have both fuselage and wing structures made primarily of carbon-fibre-reinforced polymer. The reason for the existence of this aircraft is due to the competition from Boeing for its Boeing 777 and 787 which are dominating the wide-body segment and Airbus had to do something about it. After a slow start to sales, the aircraft manufacturer managed to capture orders of more than 700 over A350s. Not bad at all for this aircraft! 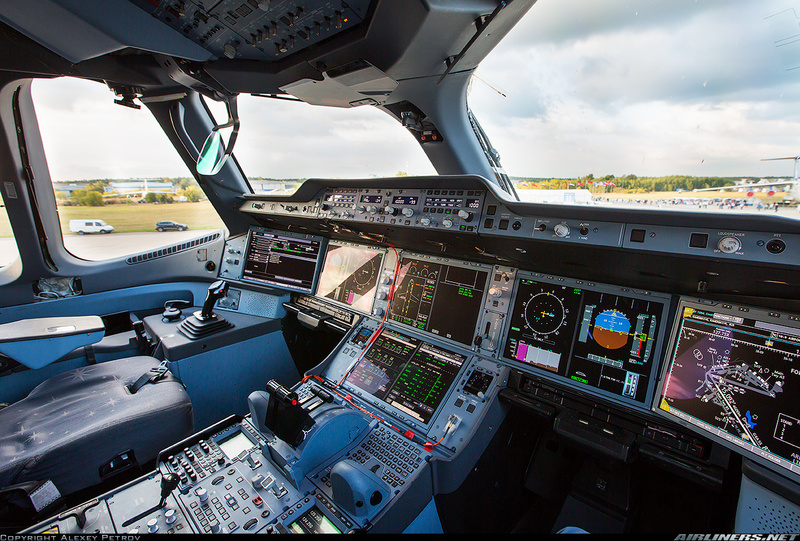 This Airbus A350 consists of 3 types:-800, -900 and -1000 series. The -800 is more or less obsolete due to its configuration being similar to the Airbus A330-800/900 NEO series. 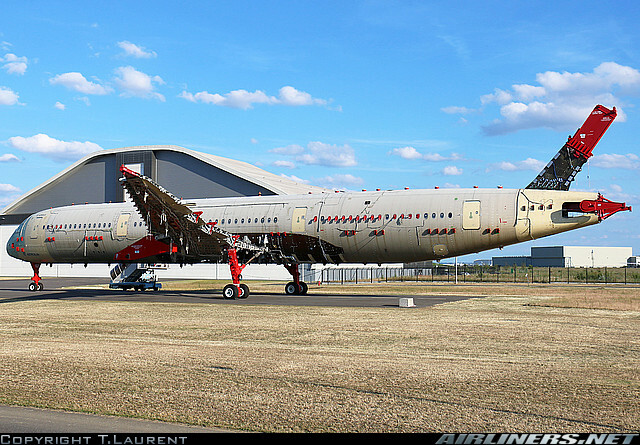 General Electric and Pratt and Whitney do not offer engines for this aircraft after long negotiation with Airbus. So that makes Roll Royce the sole engine maker for this aircraft type. General Electric offered engines for the -800 and -900 but not the -1000 as it doesn't want to compete with the Boeing 777-300ER directly. With that, talks between Airbus and General Electric ended and that's the short history about it. As for Pratt and Whitney, it was never in the running. 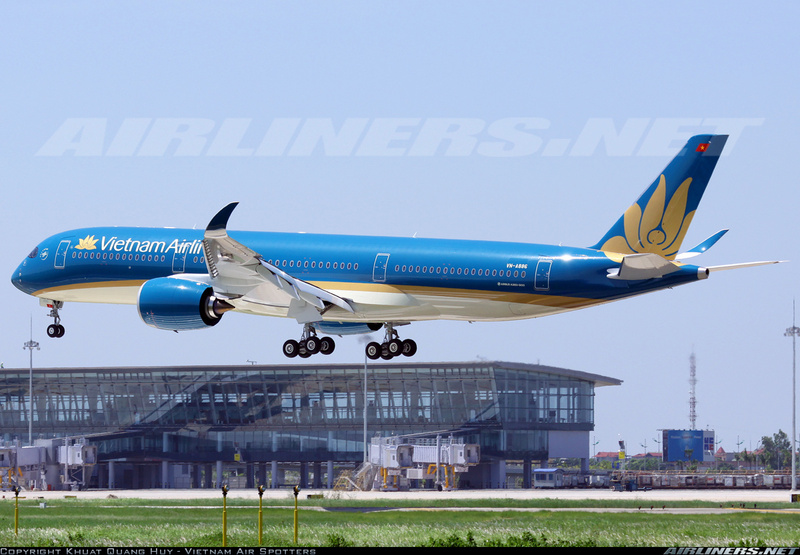 Besides Vietnam Airlines, other operators such as Qatar Airways, Singapore Airlines, Cathay Pacific, TAM and Finnair are operating this aircraft type. 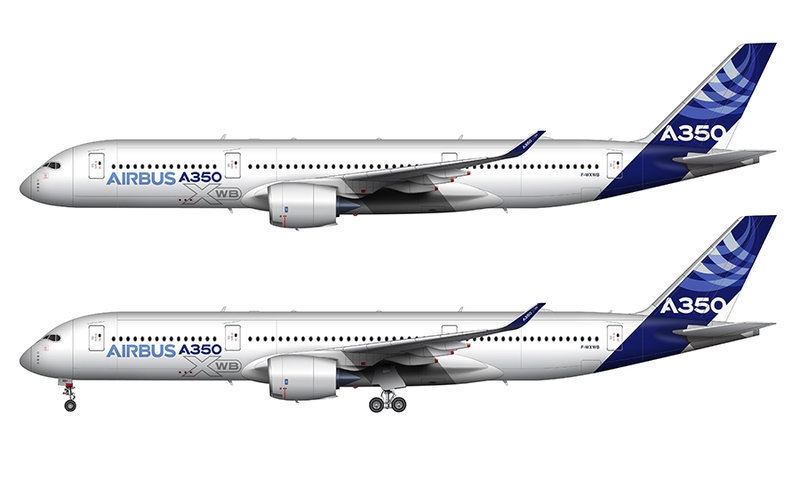 More operators such as Ethiopian and Thai will be joining the A350 family soon. 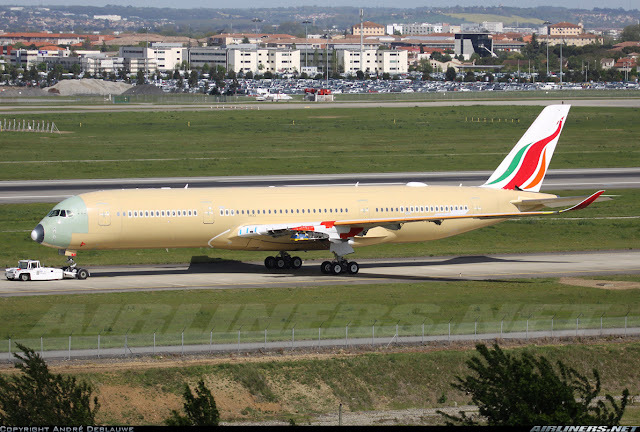 Its significant for Ethiopian because the A350 would be the first Airbus aircraft the airline is operating. It currently operates only Boeing aircraft. A new aircraft type usually have to undergo thousands of flight hours of testing in all kind of weather condition in order to obtain the certification of airworthiness. This process takes a couple of years to complete. As for the subtypes, it takes lesser time to complete its test. 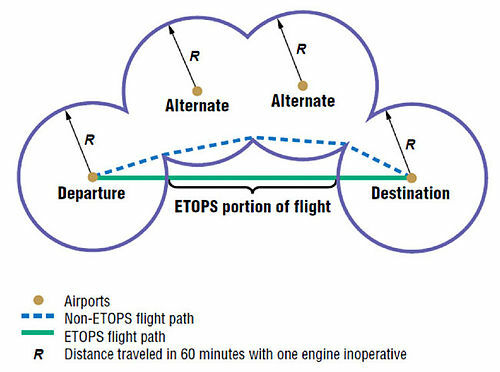 What is important for the aircraft manufacturer is that it is able to meet the customer's requirement (usually aircraft's performance) and for a twin engine like this, ETOPS (Extended Range Operation with Twin Engine Jets) is required and major airlines are hoping for diversion time beyond 180 minutes. 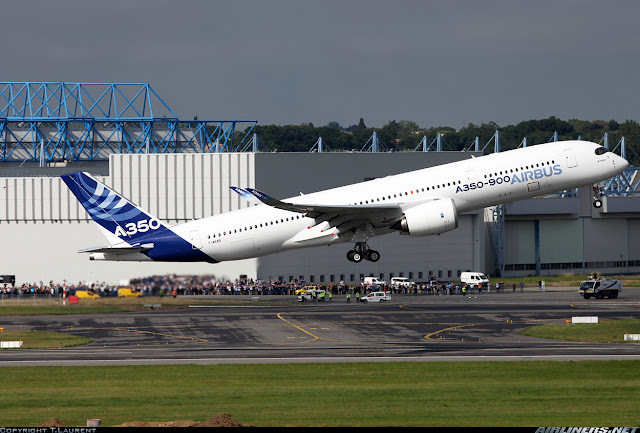 The first A350-900 made its maiden flight and along with its siblings (MSN 2-5), they undergo many flight tests to meet the safety requirement in order to get the certificate of airworthiness. Without this certificate, airlines cannot take delivery of this aircraft. This Sri Lankan Airlines Airbus A350 is being towed to the paint shop to be painted and also needs the engine installed before the test flights commerced. This is the static air frame used for testing, now it is stored. 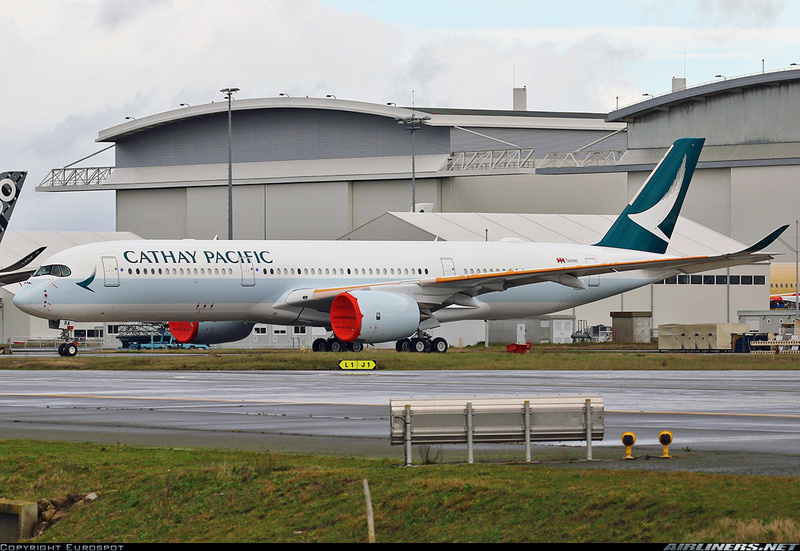 Cathay Pacific's Airbus A350-900 was ready for its first flight. The airline had to delay the delivery of the first A350 due to the delay of the cabin installation of the business class seats. Row 10-15 is Premium Economy rows, so if you are flying on the domestic route, you have a chance to experience it. Although no window seat was available, I was satisfied with the aisle seat. The rest of the cabin was vacant at that time of checking in. The flight that day was full, not a single vacant seat left, that's how popular Ho Chi Minh to Hanoi route is. This is probably my fastest web check-in. Usually I take my own sweet time to decide which seat to take. I woke up at 5.30 and left my hotel half an hour later. I prefer going to airport early to walk around and stretched my legs before boarding my flight. 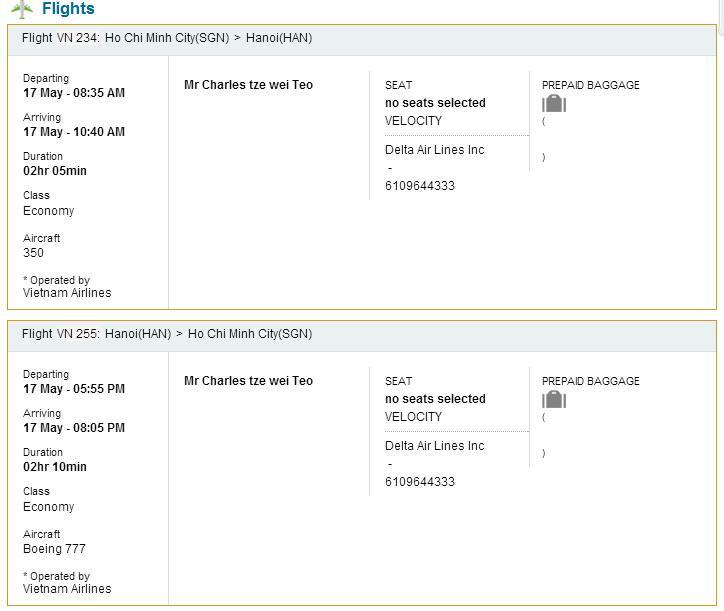 For Vietnam Airlines domestic flights, you can check in early just as long as the check-in counters are opened so no worries about going there 3-4 hours before schedule departure time. Usually the cheapest airfare won't allow you to change flights, so if you want to have this flexibility, you have to pay more for it. Vietnam Airlines dominate the check-in area, but there are separate counters for Economy and Business Passengers, do take note. Lots of passengers but there are separate queues for web check-in and passengers travelling without baggages. Fortunately I got the shorter queue and managed to get my boarding pass within 10 minutes. It was a hassle queueing up but the check-in staff were efficient. Got my boarding pass and my assigned seat, 15C. Security check-in this time was long, took around 15 minutes to get to the air side. At the air side now, lots of seats available and the best thing of all - Free Wifi and this time you can connect to it with a click of the button. The old flight display sign board - you can't miss it! Not many passengers around this area. After breakfast, I walked around while waiting for my aircraft to appear at the gate. Unlike my previous flight to Hanoi on the airline's A350 (trip report), there was no delay this time. At that time there were 2 Airbus A350-900 parked at the remote parking lot, VN-A886 and VN-A887 and I was hoping for the latter as I have already flown on A886, but sadly VN-A886 was towed to my gate while VN-A887 was on her way to Shanghai. Checking Flightradar24 history, it wasn't a surprise since A886 had flown to Shanghai for the previous 2 days. Looks like full flight and it turned out to be. The signal from the phone may interfere with the communication system which the pilot will use to communicate with the Airport Traffic Control (ATC). The statics from other signals may make it harder for both ATC and pilot (in charge of radio) to listen what they are saying, therefore the FAA (Federal Aviation Adminstration) imposed this rule to either switch off all cell phones or keep them at least in flight mode (depending on country's aviation ruling). For Vietnamese aviation, cell phone can be left on provided its in in-flight mode. Announcement to board the aircraft was made and passengers had already form a long line at the Economy Class. Some Economy Class passengers decided to take the shorter queue (Business class queue) and ended up being told to join the longer queue instead. Some of them just stood where they were and stayed at their position for a while, causing others behind them to be frustrated. In the end, they manage to board that queue once no other premium class passengers turned up. Excited to be flying the Airbus A350 once again! My 3rd time, I was still hoping for the middle seat to remain vacant. Welcome on board, flight VN234! For business class, do check out this trip report. This crew you see in the photo below is the better ones on my flight. Same seats at the Economy, only thing better is the legroom space. Why isn't the Premium Economy configured in 2-3-2 like the 787 Dreamliner? Seat 15A, I wished I was sitting there. An elderly passenger sat there and he took quite a number of photos with his cell phone, only wish he had switched his phone to silent mode. Unlike my previous A350 experience, the IFE system wasn't available for us on this flight. Legroom space does make a difference especially on long haul flights. I tried the bulkhead row (row 10), pretty spacious. Only for the bulkhead row, the remote control is at the side and the IFE system is stored at the hand rest area. Apart from the legroom space, there is no other differences between this and Premium Economy Class. Most passengers had switched the In-flight Entertainment system off. You are able to read the reviews of the latest news feed but have to pay to use the internet to access the rest of the article. Expensive data plan, not worth the try. Quite tasty but not many passengers finished off the burger - not sure why. It was my 3rd time experiencing the Airbus A350-900, 2nd time on VN-A886. The exciting part was trying out the Premium Economy Class cabin. The cabin crew were similar to my previous Vietnam Airlines experience, so nothing much to talk about here. Except for a couple of crew who were exceptional. I made my way to the seat 15C and seeing that my seat mates had not arrive, I took some window shot photos and seat photos. Not surprisingly, they turned up not long after. Departure time came and go, but no updates from the flight crew. Why? We had no idea. My seat mate was grumbling in Vietnamese and I can understand why. Finally we pushed back about 25 minutes after schedule departure time and engines were started not long after. The noisy hydraulic pump extending the flaps were heard - pretty noisy to say the least. After that we taxied to runway 25 Left and this time the Captain came online to apologise for the delay and informed us we were number 6 in line for take off. No update from him regarding the delay at the gate. He also mentioned the good weather on route and would update us the weather in Hanoi during the flight. Take off was smooth and we were soon on our way to Hanoi. Unfortunately for us the IFE (In-flight entertainment) system was not in used so some of us were sleeping while I was just relaxing, waiting for breakfast to be served and after the meal, I took a short nap before arrival. After 25 minutes of flying, breakfast was served and we were not given a choice, only drink service we were given a choice between coke or water. It was too early for soft drink so I chose water. Service was served by one of the better crew and it was nice to be smiled at this time round. After the meal service, I walked around to check out the cabin, it was a full flight. So for booking on domestic flights, its better to select your seat asap when the web check-in for your flight is opened. Captain announced to us that the weather in Hanoi was clear and it was to be finally after my 3rd flight into this airport. Weather this time was better than my previous visits. Temperature was around 28 degrees, making it slightly cooler than the weather in Ho Chi Minh City. We made a smooth landing and taxied to a airport gate. I was hoping for the aircraft to park at remote parking lot so that I could snap some exterior shots of the aircraft. My overall experience was an enjoyable one, the Airbus A350 is indeed a joy to fly on. Apart from the noisy hydraulic pumps, its a very quiet aircraft in the inside - someone near you having a conversation or hearing someone's cough can be easily heard. I had to settle for this kind of shots since I couldn't get the window seat. Spotted fellow company's 787 Dreamliner while on the way to the runway. After disembarking from the aircraft, it was a 10 minutes walk from the gate to the arrival hall. Thanks for the ride, VN-A886! At the arrival hall, after that I went up to the departure hall to check in for my return flight. Vietnam Airlines Airbus A350's in-flight products may not be as good as the others. (Looking at the photos so far) but the airline offers one of the cheapest airfares from Asia to Europe. As a member of Skyteam alliance, you can also earn miles and redeem for flights or upgrades to Premium Economy or Business class. This airline is also one of the airlines part of 'Optiontown' program which means you can bid to upgrade yourself to a higher class cabin for all flights. Premium Economy Class on the A350 would be better with 1 or 2 seats lesser on the same row. Perhaps 2-4-2 would be great for passenger's comfort but airlines do what they have to do and that is to make as much money as possible. Still, for the legroom space I think its worth paying a bit more for it. For my flight experience, I had a mixed feeling for the in-flight service. The in-flight meal was decent and the flight to Hanoi was enjoyable. The A350 is certainly an upgrade over its older sibling, the A330 and A340, and this new aircraft will certainly play a big role for the operators around the world. Enjoyed that Charles, Is the difference in Premium Economy anything to do with leased or bought frames. Only guessing. The difference in Premium Economy has to do with the fact that airline wanted early deliveries of the Airbus A350 as some of the lease of the Boeing 777s were ending and needed replacement, so Airbus provided these 4 aircraft (VN-A886 to VN-A889) with this cabin product. 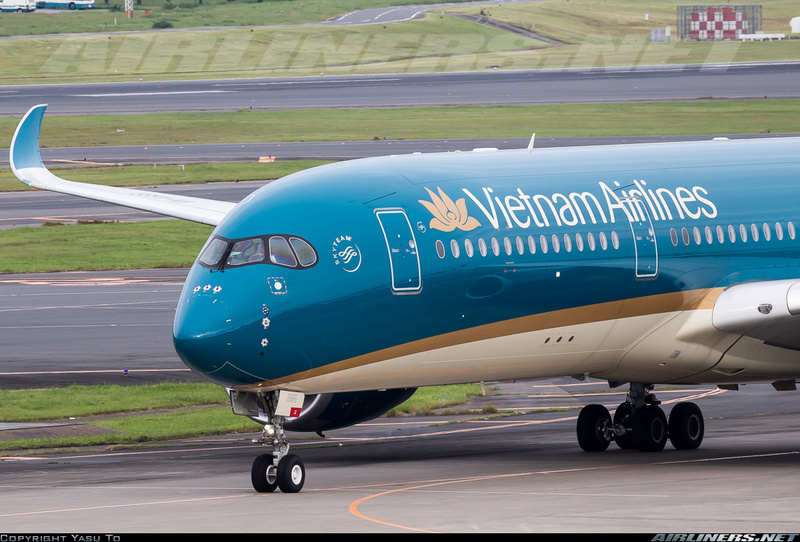 Its believed that VN-A890 onwards would be using the same product as the 787 Dreamliner. We have to wait and see when the 5th A350 enters the fleet. Hopefully they have the 2-3-2 Premium Economy for the 5th aircraft. Should be this Sept I guess. I heard they are going to use the same Business Class cabin of 787 for 350 from now on. Do you think they will replace this 3-3-3 into 2-3-2 in the future? I found it is truly terrible when they have a mixed cabin like this. If you have flown 7879 of Vietnam Airlines from SGN or HAN to NRT Tokyo you will notice that these 2 aircrafts (VN-A865 and 866) dont have Premium Economy Cabin and it is truly annoyed not for Narita route but sometimes the aircraft is not always ready and sometimes, they use this aircraft for SGN/HAN to LONDON route which means those purchasing Premium Economy cabin will end up getting economy seat (or they might bump them to Business?). In total I want to see, why not making them all the same with 3 cabins instead of just 2 for Japan routes? Its hard to say, because what's important for the airline is making money. Won't be surprised if they keep the 3-3-3 for the Premium Economy Class. Yeah, its down to one's luck when flying on VN's flight. You get both old and new products and if your scheduled aircraft is changed from A350 or B787 to B777 or worse, the A321, you can't help but be furious about the change. The airline has the answers that the rest of us would like to know! I am just as curious as you. Thank you for the information, Ngoc! Ohh, the 787-10 is definitely confirmed? That's great news. I am not sure about the 777X, it may be too large for Vietnam Airlines.